They had names like Lon and Ray and Tennison and Dollins. They came from New York and Texas and Oklahoma and Nevada. They were single or divorced, educated or not so much, and they all had one thing in common. They wanted to serve their country in time of war. And they did. Officially. Starting 71 years ago today. 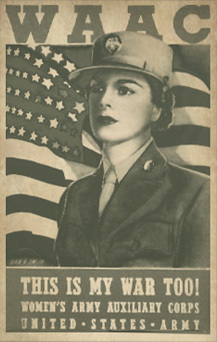 They were among the first enlistees of the Women’s Auxiliary Army Corps (WAAC), given official military status as of 15 May 1942, when President Roosevelt signed into law the first federal statute enabling women to serve officially in noncombat positions. An electronic database of Army enlistments — including WAAC enlistments — is in the National Archives.5 It’s also available on Ancestry.com. While many of the original military records perished in the 1973 fire at the National Personnel Records Center in St. Louis, most of the enlistment data is readily available. And there you will find them. Women in the military.17 Officially. And it began 71 years ago today. Thanks for this tribute to women! A history with examples of particular women. I appreciate your doing this research and informing us all. Thanks for the kind words, Mariann! And we thank both your in-laws for their service! My next door neighbor when I was a kid was a veteran. Marcedes Maxine Hoffman. She tried to enlist in the Navy but she was so skinny they wouldn’t take her so she enlisted in the army, served as chief surgical nurse and did her boot camp at Ft. Riley KS. She was transferred to Camp Dodge, Iowa, then to Camp Hale, Colorado where she first saw penicillin. Next she served at Winter General in Topeka, Kan where she served as the assistant to the chief nurse. Her last post was Ft. Robinson, Neb. After her discharge she returned to Hampton, Iowa and worked as a nurse at the hospital for 26 years. Great story, Toni! Hats off to all who served! My mother Mary A Fiamma Bergen was a WAC during WWII. She was stationed at Ft Dix, NJ & drove the officers around at the base. My father was also in the army. And our thanks to both your parents for their service! Thanks so much, Jana! It’s always an honor to be included.